Suzan DelBene is, of a sudden, making some progress in her endeavor to beat Rep. Dave Reichert ("Sheriff Hairspray" as he's known to former law enforcement colleagues) in the 8th District election. 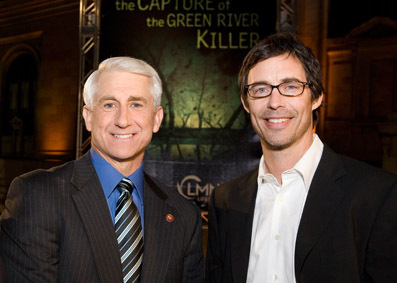 With Suzan DelBene closing in on the Bland Bombshell, 8th District Rep. Dave Reichert, it's time to dust off our 2006 exposé of the drastic... er, expansion of the facts in his repeated claims of catching the Green River Killer. Fact is: technology caught the killer, not Detective Reichert's dogged shoe-leather sleuthing as his press and the breathless Lifetime Channel movie so dramatically, yet eroneously recounts. Even then, on Sheriff Reichert's watch, the saliva sample that could have busted Ridgway as early as 1996 when the DNA technology became available, was not tested until 2001. Stupid has a gravitational pull. ~Dave Ramsey. “Now, first of all, are there any reporters in the room? Does anybody recognize… are there any people in here that you recognize as strangers? So we know that all of us in here are family, right?" Then Rep. “Transparency Dave” Reichert (WA-8) totally busts himself, bragging to a roomful of Republican PCO’s that his pro-environment votes have all been tactical to keep environmentalists and their money off his back in his swing-y district. Is talk radio's 'poutrage' and violence losing the war for the right? Can the torching of the national conversation and threats by the talk radio culture drive vital independents away from Republicans? Reichert blows off KUOW -- again! It was the third time in three weeks! Today, Rep. Dave Reichert stood-up Steve Scher on his market-leading Weekday (KUOW m-f, 9-11a). (photo: Dave Reichert- the package, unfortunately, is empty). Funny, we've heard The Haircut around the dial a lot lately. 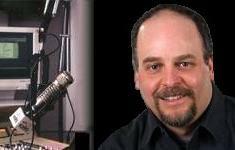 On Kirby Wilbur, Dori and Dave -- last weekend on KVI's Cop Talk (Sat. 6-7p). Even the cops tried to lick Reichert to death, and he purred like a kitten. 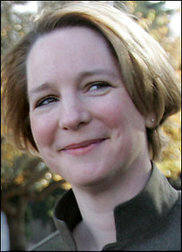 Democrats are launching a radio ad campaign against 28 congressional Republicans who have obstructed President Obama's stimulus package, and the children's health bill. Targets include 8th District haircut, Dave Reichert, as always seen as a liberal Republican who's vulnerable in 2010. In the dry-spell after the long feed at the 2008 election trough, it's a much-needed stimulus package for stations dining on the bread & water of what's left of the retail advertising. 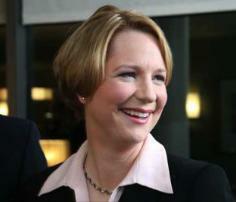 Darcy Burner will appear this afternoon on The Rachel Maddow Show (KPTK m-f, 3-5p). Darcy is running hard against the Auburn fly-weight, Rep. Dave "Hollywood" Reichert, the 401st most influential man in Congress. Burner will speak with Rachel about The Responsible Plan to End The War in Iraq, a substantive 36-page exit strategy for the seemingly intractable mess we're in written by a group of Democratic congressional candidates with some military experts. Darcy lays it out in a Seattle Times op-ed here. Marketing masterpiece: sheriff dave reichert, serial killer killer. "[Dave Reichert] desecrated the victims. The public ought to know that," says Seattle University journalism and criminal justice Professor Tomás Guillén. The pristinely coiffed sheriff (above left with the actor who plays him) is portrayed as the dogged cop who got the Green River killer in The Capture of the Green River Killer, airing Sunday and Monday nights on the Lifetime Movie Network. Guillen is describing Republican 8th District Congressman Reichert, known in local law enforcement as 'Sheriff Hairspray' -- and for his manipulation of the Green River murder investigation in order to climb up into party politics. The movie will keep alive the Reichert-stoked myth that his police work and determination was responsible for the arrest of Gary Ridgway. Many argue the opposite is true.